Do you remember when in one of my earlier posts I showed this picture of a flower that I did not know the name of? I am happy to report that the mystery of the beautiful thick patch of trumpet-like yellow flowers growing near the Medicine Wheel garden is now solved! It was actually, M, one of the kids who built that amazing 2-story fort, who taught me what it was. He and his family were out back with me, taking a tour of the grounds, when M discovered the patch and demonstrated a seed pod exploding with a sudden pop! “They are called Touch Me Nots”, he explained, and I was very impressed. (I was also thinking about how just a few nights before at their bonfire, he had demonstrated a cap exploding off of a twisted plastic pop bottle!) The very next day, K (the son of the couple who built this cabin) told me the same thing. He was out working on his land and I went over with some fresh muffins. He told me that he had figured out my mystery flower. 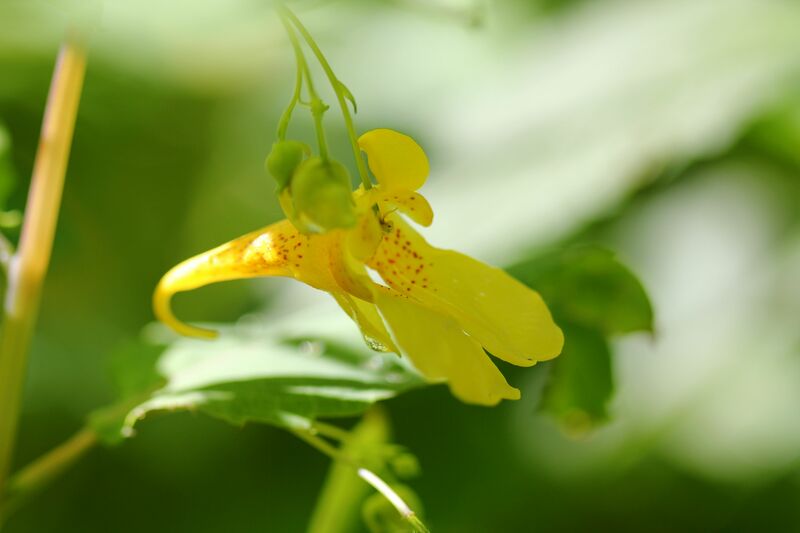 We walked over to his car where he pulled out his guidebook on medicinal flowers of Alberta and showed me the unmistakable picture of Touch Me Not (Impatiens pallida), also known as Jewelweed, Yellow Jewelweed and Spotted Jewelweed. Touch Me Not is a self-seeding annual plant, which can grow up to six and a half feet tall. (Mine are about four feet tall.) It often grows in ditches and along creeks. The triangular leaves have toothed margins and are silvery green in color. 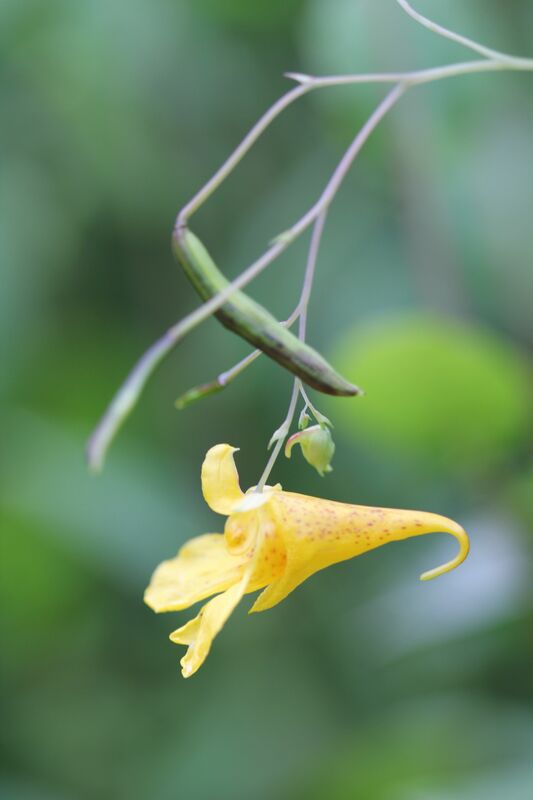 The flowers are yellow with a three-lobed corolla; one of the calyx lobes is also yellow and forms a hooked conical spur at the back of the flower, forming the back of the trumpet (or funnel) shape. 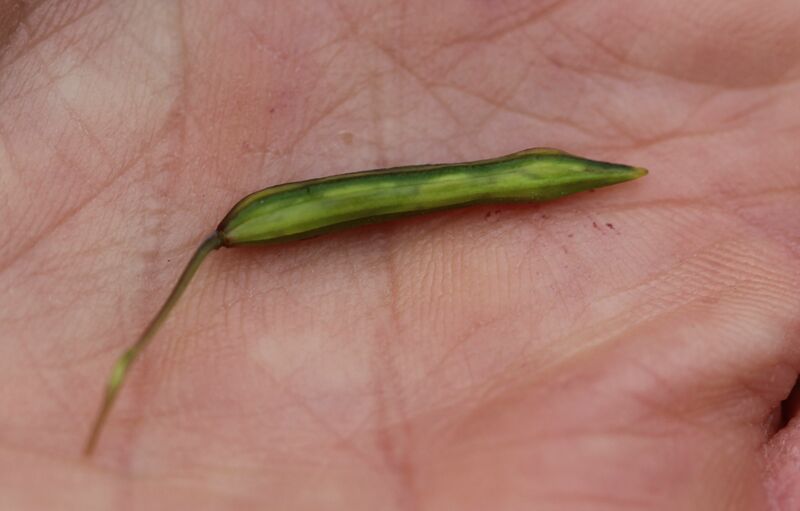 The seed pods have projectile seeds that explode out of the pods if they are lightly touched when ripe. See this youtube video for a demonstration. You may be more familiar with Orange Jewelweed (Impatiens capensis) which is more common. Often these two will be found growing side by side. Make a poultice for skin rash. I look forward to learning more about this beautiful plant!